melancholy and madness. He says, "My father was temperamentally nervous and obsessively religious—to the point of psychoneurosis. From him I inherited the seeds of madness. The angels of fear, sorrow, and death stood by my side since the day I was born." Over many years he veered between many styles Naturalist to Impressionist and beyond trying to define his way of looking at the world. In the end he settled into a far more stripped down school of symbolist painting that relied almost not at all on the true nature of things but on their emotional and psychological contexts. His final style often makes people representative of one particular psychological context rather than representing the swath of human emotion. Further, he employed very shallow paintings where often the scene appeared merely a stage backdrop to the characters rather than a true living space. He often even neglected the exterior space focussing entirely on the symbolism of the figures. forms caused quite an uproar leading to his exhibit being shut down after a week although he continued a private showing for many weeks. 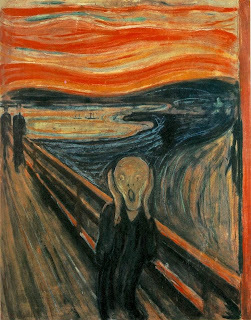 His most famous painting, The Scream is shown here. His description of the work follows. It is a blunt and simple expression of fear and madness expressed through uncertain flowing brushstrokes in the land as well as bright and often unnatural colors. Oil, tempera, and pastel on cardboard. 1893. He often crafted works with sexual overtones. He never became truly comfortable in his own body nor with the widespread bohemian artist lifestyle. Pieces such as this one and his Madonna in The Frieze of Life series indicate this discomfort and intrigue in the human sexual drive. This painting is an homage to his dead sister who he loved dearly. Her death continued to inspire sadness and suicidal thoughts into his late life. This portrait shows both his initial facility in figure drawing as well as his imfatuation with the morbid. He would always be cynical of the human condition. I chose Edvard Munch mostly because he was able to forge through the styles of all the popular painters of the day and create something of his own (even if he was a little mad). Who isn't? I really appreciate the use of color to impart emotion, and I respect someone who can bottle up all that craziness and depression for so long and channel it into something great. Eggum, A., & Munch, E. (1984). 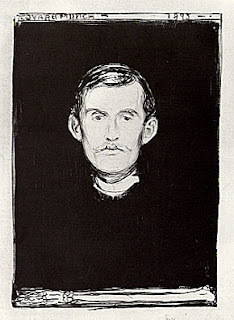 Edvard Munch: paintings, sketches, and studies. New York: C.N. Potter. Born in Argenteuil, Val-d'Oise on May 13, 1882 in the wake of Impressionism, Georges Braque grew up in Le Havre and spent half of his life on the Normandy coast. His father and grandfather had been decorators and house painters, and Georges Braque trained as one as well. He enjoyed learned tricks and techniques that enables him to produce cheap imitations of gilt, marble, and expensive woods. Meanwhile, he studied more advanced artwork in the evenings at Ecole des Beaux-Arts in Le Havre. On Sundays in his youth, we would pass the time paintings landscapes and portraits of his family, most specifically his grandmother and cousin. In 1900, when Braque was 17, he left for Paris to be an apprentice to a decorator, and attended Academie Humbert, where he painted until 1904. Braque's earliest works were impressionistic, but in 1905, after seeing an exhibition of Fauvist paintings (including works by Henri Matisse) Braque altered his style to include more brilliant colors and loose forms to invoke a greater emotional response. Between 1906 and 1910 Braque's subject matter also changed some more. Landscapes, which had previously predominated his artwork, had thinned out by 1908 and his attention had turned to still-lifes. from 1908, for example, Braque folds over the back of the lute and reverses the hidden side of the peg box. 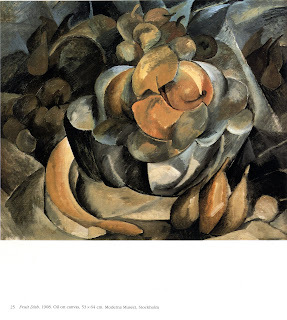 It was the start of a process of dis-juncture that was also used in Braque's famous Fruit Dish painting from 1908 (see below). Braque, along with Pablo Picasso, developed the art movement known as Cubism, which uses similar techniques to those described above along with an emphasis on geometric shapes. While their friendship had many ups and downs, there existed a bond that enabled Braque and Picasso to exchange discoveries and pool their results; in short to offer mutual support at a crucial time – the birth of modern art – in which they played an important role. In 1912, Braque and Picasso experimented with 'papiers colles' which is similar to a carefully and intricately created collage. It consisted of cutting and gluing together many pieces of paper (usually wood patterned) and juxtaposing the colored paper. 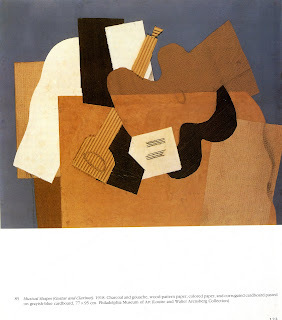 One example of Braque's papiers colles is Musical Shapes: Guitar and Clarinet (1918). In 1914, Braque enrolled in the French Army and was severely wounded in World War One. 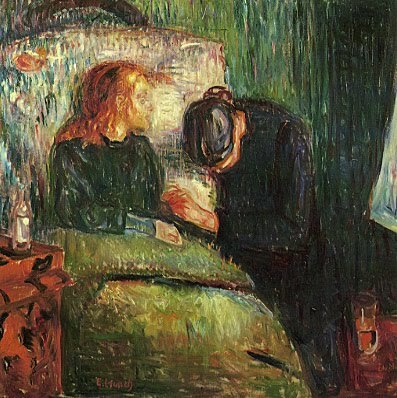 He returned and continued painting, although relaxed his Cubism style and focused on works that included human figures. As surrealism emerged, he incorporated a little of it into his work, but did not embrace the style as much as he had Cubism. Picasso continued to adopt new styles and his popularity outgrew Braque. Braque died on August 31, 1963. I choose to research Georges Braque because I noticed his paintings while flipping through some books and I liked his chaotic style. The first painting by him was Studio 3 (1949-1951) (below) and the collection of styles and shapes confused my mind. Some aspects of the painting seem so realistic, while others seemed abstract. I enjoyed the emotional response the painting invoked so I decided to investigate more about his work. (1982) Braque: the Papiers Colles. Washington DC: National Museum of Art. (2005) Braque and Laurens: A Dialoque. Paris, France. Messensee, Caroline. 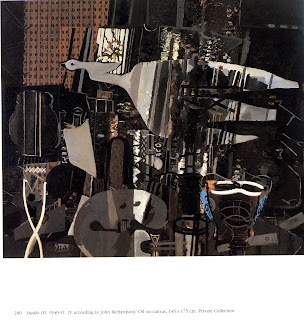 (2006) Georges Braque: La Poeticque de l'objet. Paris, France: Skira. Zurcher, Bernard. Translated by Simon Nye. Georges Braque: Life and Work. New York, New York: Rizzoli. Al Hirschfeld was a very well known caricaturist. He was born in 1903 in St. Louis, Missouri. As a teenager, he grew up with his family in New York City where he studied art. Hirschfeld was able to accomplish many things at such a young age. At the age of 17, he was an art director at Selznick Pictures. After Selznick went out of business, Hirschfeld traveled to Paris, where he continued to study painting, drawing, and sculpture. When he returned to New York he was set on pursuing a career as a painter but one of his sketches of an actor led his work to be published in the NY Herald Tribune, Times, and other New York newspapers. This began his series of theatrical drawings. Hirschfeld became known for his very unique style in his caricatures. Most of his drawings were very linear, done in black ink on white paper. They were simple and thus much more “cleaner” than other cartoonists’ drawings. 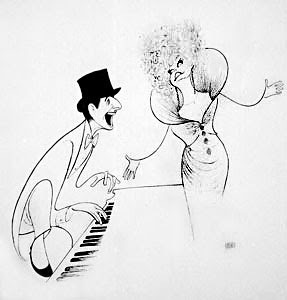 Hirschfeld attempted to use the minimum number of lines in his drawings. As Hirschfeld’s career developed, he became famous for his illustrations of Broadway plays. 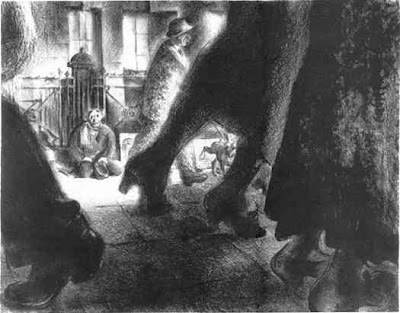 His illustrations were meant to effectively portray the play in order to show people before opening night. He also began illustrating the casts of the plays to include in reviews in The New York Times. He also continued to drawing politicians, TV stars, and celebrities. This brought Hirschfeld fame and recognition as most people felt honored to be illustrated by him. 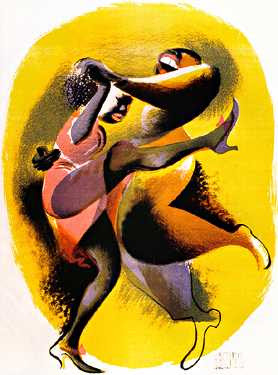 It is during this time when Hirschfeld returned to using the medium of lithography in his work, as is seen in his illustration “Lindy Hop”. During the Forties, Hirschfeld also began incorporating another unique style into his art. After his daughter Nina was born in 1945, he began drawing her name in the background of his drawings and even included them in strands of hair, sleeves, and folds. This further added to Hirschfeld’s style and attention to lines. To the public, this became known as the “NINA Game” and Hirschfeld even began including a number next to his signature to tell people how many NINA’s were in the drawing. Later on Hirschfeld also collaborated with S.J. Perelman on projects, including Westward Ha!,and Around the World in 80 Clichés. In 1991, Hirschfeld was commissioned to draw postage stamps commemorating famous American comedians by the US Postal Service. 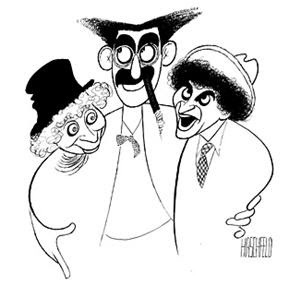 This once again brought recognition to Hirschfeld’s work. His work continues to be displayed in the Metropolitan Museum of Art and the Museum of Modern Art. 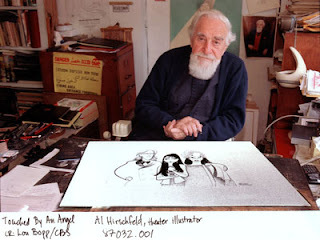 On January 20, 2003, Al Hirschfeld died of natural causes. I chose Al Hirschfeld because from the start his work attracted me. Looking at his caricatures, his use of lines drew me in. Most of his drawings lacked lines that made them very unique. Hirschfeld seemed very dedicated to his work and study or art because he used the money he made from his work to fund many trips to study art. His motivation to advance in his work and for his personal knowledge inspired me. I also enjoyed his incorporation of a game in his art pieces for his audience. It was evident that Hirschfeld enjoyed pleasing and entertaining his audience. 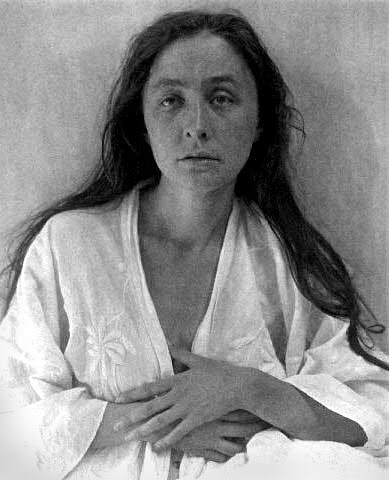 This is a photograph of Georgia O'Keeffe. The manner in which I discovered my love for this artist was rather unique. It was not through my browsing books, art museums or even the internet that I stumbled upon her work. I became fascinated by the love the photographer Alfred Stieglitz carried for this seemingly average looking woman. The image to the left is a portrait done by Stieglitz in New York, 1918. 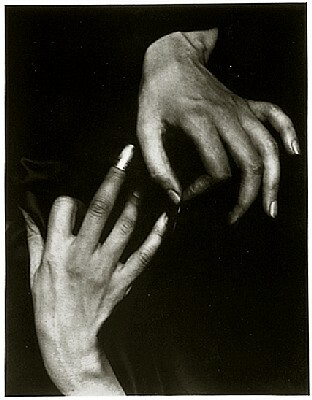 Stieglitz was married to his wife Emmy when the two found one another. After years of correspondence the Alfred promised his lover a quiet studio where she could paint. 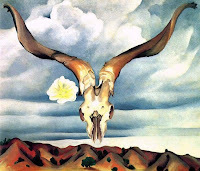 He would use O'Keeffe as the model for most of his work. Once his wife Emmy discovered one of these impassioned photo sessions Steiglitz divorced his wife and ran away away with Georgia. The two were inseparable and a neighbor recounts the relationship by saying , "they were like two teenagers in love. Several times a day they would run up the stairs to their bedroom, so eager to make love that they would start taking their clothes off as they ran." Stieglitz risked everything for her. O'Keeffe was his muse and provided the push he needed into his experimentation with modern art in the 1920s. He photographed O'Keeffe obsessively between 1918 and 1925 and produced over 350 prints that encapsulated her or the idea of her. Stieglitz would depict only segments of her (torso, hands, neck etc) which was consistent with the abstract aethsetic of the time. These two images were portraits made around 1920 of O'Keeffe. Stieglitz would title these "A Portrait" and later gave his pieces titles equally as vauge like "Equivalent". His infatuation with her fascinated millions and inspired the modernist artists of the time. It's effect was the same on me. His passion for this average looking woman made me want to know her. I had t know what made this woman so intoxicating. Georgia O'Keeffe was born November 15th, 1887 in Wisconsin. 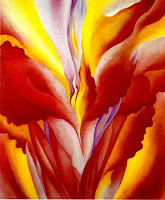 O'Keeffe lived until she was 98 years of age. Georgia grew up in a large family and was pushed by her supportive parents to go and persue her art in school. In 1905, O'Keeffe enrolled at the School of the Art Institute of Chicago and three years later she attended the Art Students League in New York City. She then traveled to Chicago, Virginia, and Texas learning and practicing art as well as teaching. It was here where she draws great inspiration from the southwest and style which resonates through areas such as New Mexico. O'Keeffe experimented in painting and charcol very early in her career. 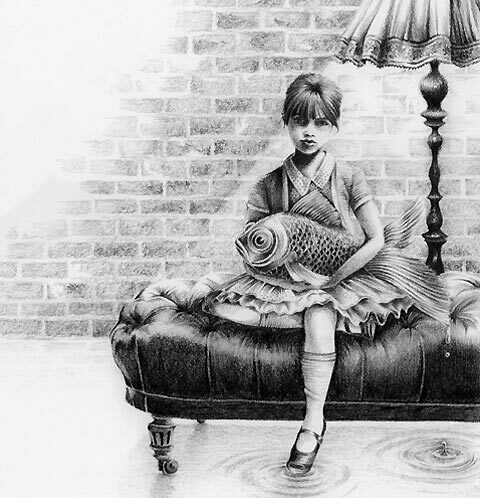 This charcoal on paper is entitled "No. 13 Special" 1916. She was known for synthesizing abstraction and representation in her work and for challenging the boundaries of modern American artistic style. During this time some of her drawings were presented to Alfred Stieglitz in his gallery 291. He was astounded. Stieglitz displayed many of Georgia's works at this time the majority being watercolors from Texas. The two fell madly in love and Stieglitz left his wife to be with O'Keeffe. They spent winter and spring in Manhattan and summer and fall at the Stieglitz family house at Lake George in the Adirondack Mountains where O'Keeffe would later produce many paintings of this countryside scenery. Artists at this time were always in conversation with one another. Many modernists saw the intimate photographs Stieglitz made of O'Keeffe exhibited at the Anderson Galleries in 1921. It created a public sensation. The circle of modernists that the couple ran with, namely Charles Demuth, Arthur Dove, Marsden Hartley, Paul Strand and Edward Steichen, deeply impacted O'Keeffe's own work. 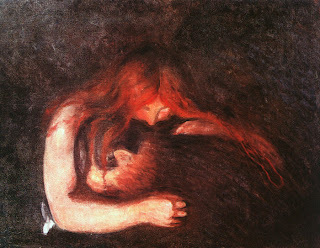 She began working primarily in oil, which represented a shift away from her having worked in watercolor in the 1910s. 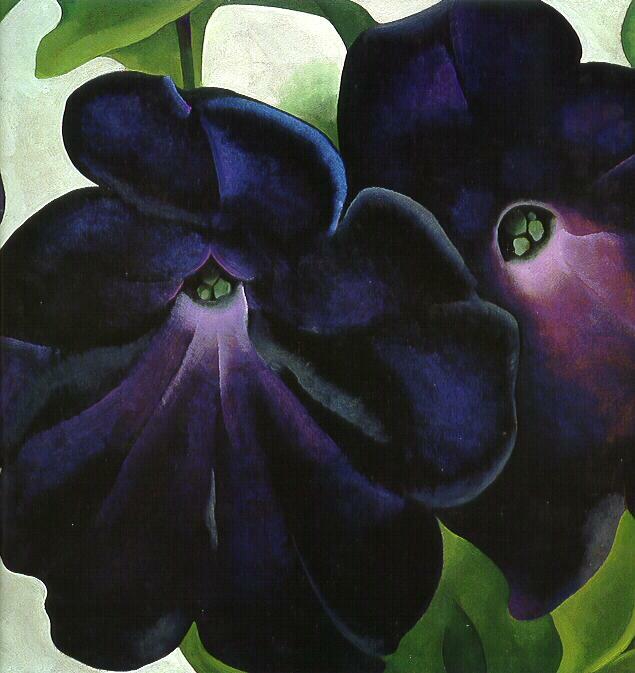 By the mid-1920s, O'Keeffe began making large-scale abstract paintings of nature at very close range. She maintained that we should preceive nature as bugs do. The image on the right is called "Black and Purple Petunias" 1925 and "Red Canna" is on the left. Many art critics maintain that O'Keeffe's paintings of flower parts are a representation of female genitalia however she constantly denied painting vaginal imagery. Nevertheless, many prominent art historians have linked her work to feminist artists of the 1970s and I assert that these paintings are intentionally sensual and sexually driven. Near the end of the 1920's, Georgia felt the need to travel to find more artistic inspiration. In May 1929, she set out by train with her friend Beck Strand to Taos, New Mexico and the two traveled the west and went to places such as Santa Fe and Albuquerque. For the mext twenty years, O'Keeffe spent part of nearly every year working in New Mexico. During her second summer there, she began collecting and painting bones, and started painting the area's distinctive architectural and landscape forms. Works such as "Ram's Head White Hollyhock and Little Hills" 1935 were inspired during this time. She became reclusive and bought a ranch north of Abiquiu and worked for many years alone completing paintings thematically set in New Mexico. Her popularity grew as she continued working as she exhibited at MoMA and The Art Institute of Chicago. While O'Keeffe was spending the summer of 1946 in New Mexico, Stieglitz grew ill and she quickly flew to New York to be with him. He died on July 13, 1946 and O'Keeffe scattered his ashes at Lake George "where he could hear the water". She then moved to New Mexico permanently to continue her work. She continued until 1971 when O'Keeffe, 84, became aware that her eyesight was failing. She then stopped painting yet did not stop to be an inspiration to the art world. Georgia dabbled in pottery, welcomed interviews, filming and even wrote a book about her art. Georgia O'Keeffe died on March 6, 1986, at the age of 98 in Santa Fe. Whelan, Richard. Alfred Stieglitz: A Biography. 1995, NY: Little, Brown. Eisler, Benita. O'Keeffe and Stieglitz: An American Romance. 1991, NY: Doubleday. Dijkstra, B. , Georgia O'Keefe and the Eros of Place (1998). Robinson, Roxana. O'Keeffe, Georgia. 2000, American National Biography Online. 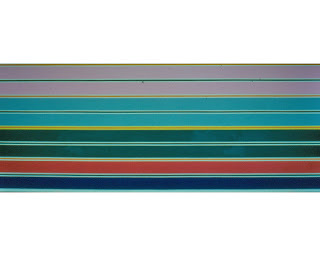 Kenneth Noland was born and raised in Ashville, North Carolina. Ever since birth in 1924, Noland was exposed to art as his mother was a piano player and his father was a semi-impressionist artist. His parents were very supportive of their four children’s artistic interests, including Noland’s. After graduation from high school which was during World War II, he joined the Air Force which was influenced by his father’s career as an amateur pilot. After his service within the air force, in 1946, Noland began his schooling at Black Mountain College, being taught by Ilya Bolotowsky and Josef Albers who both had significant impacts on Noland’s art. Noland expressed influences from Albers in his works which demonstrated the attitude of art as problem solving, the direct handling of materials, the use of geometry, and the emphasis of color. He showed juxtapositions of distinctly, different colors as well as holding a symmetrical and concentric design constant. He also expressed his judgments of color not theoretically, but in ways of intuitive feeling for relationships. Although Albers demonstrates a great influence on Noland through his works, Noland claimed that Bolotowsky had a larger impact on his development and considered him as a mentor figure. Noland liked Bolotowsky’s openness in working with abstract art in various ways. His working with these two teachers resulted in his art education beginning with nonobjective art; the study of the fundamentals of art as line, form, and color which is envisioned of abstractly. As Noland developed his art form more, he began to use cubism in a more expressive manner. He shifted from his hardedge and smoothly finished geometrical works to a more physical and spontaneous type of art emphasized by artworks done by Paul Klee and the School of Paris, that he attended, which came to have major influences on Noland. He eventually began to unite two art types which were the ideal and the physical, with the geometric and the painterly. He expresses a physical sense of space with meaningful brushwork, staining, overlapping edges and the illusion of diminishing forms created by concentric bands of color. He also incorporated irregular edges, diagonals, curves and sphere, either combined or alone. Noland was always about symmetry and the center. He worked a lot on mansonite and used a thick build up of paint within his works. At times, he would use a palette knife to apply the paint and also would occasionally scratch into the paint to obtain a graffitolike effect. Around 1953-54, Noland began to experiment with plastic-based paints within in his works, rather than oil-based paints. He began to use Magna, which is a paint that is compatible with oil but has acrylic-resin as a binding means. He considered his works with Magna as “one shot” paintings because it was very difficult to re-work a color due to the paints nature. His works during this time period reflects his continued experimentation. Noland’s first important works are considered his concentric circles. He then moved on to create his cat’s eye pictures in which his concentric circles are replaced by an ellipsoid or oval which also contained smaller ovals or circles. In these types of paintings, Noland painted the entire canvas. 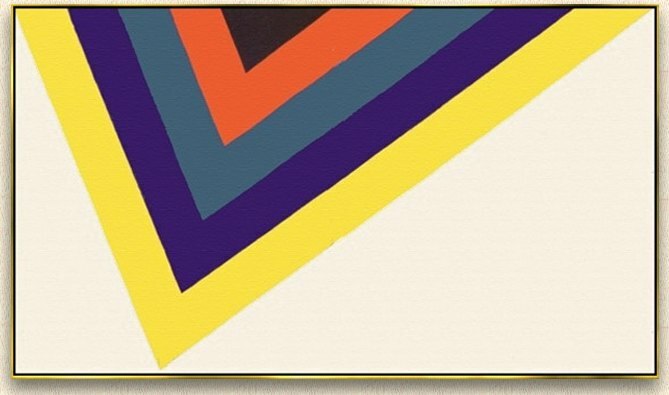 Around 1963, Noland began to work on his chevron series in which he used v-shaped bands of color that fanned out symmetrically from a central vertical axis. This was a distinct shift from his curved edges with circles to the straight edges of the chevron. His chevrons were of more incisive shape and intense color compared to his circles. Noland also began to play with diamond shapes and horizontal stripes within his works. By 1970, Noland started to shape very eccentric canvases. These were extremely complex and reflected a high control over color. 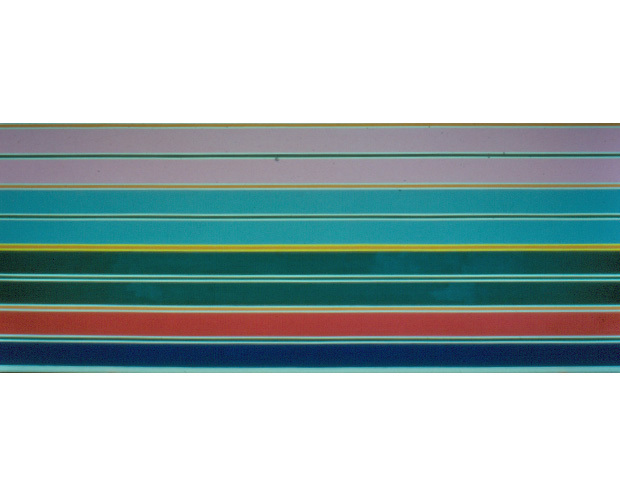 I picked to explore Kenneth Noland’s work because I admired his bold works of art. At first they seem very simple and not involved, but I soon came to realize that they had very powerful emotions involved. I liked particularly his choices and uses of color in all of his works. I also liked that he had certain particular core patterns that he choose to depict in several of his pieces. One of Noland’s first pieces. He felt that he best conveyed his color sensibility with the circle shown by Beginnings. It is both a specific as well as a general form. Bend Sinister is an example of one of his works involving the chevron. His use of color is very distinct depicting straight edges. Stria is one of Noland’s stripe works of art. He uses pairs of wide color bands that are interrupted by narrow different color bands. Moffett, Kenworth. 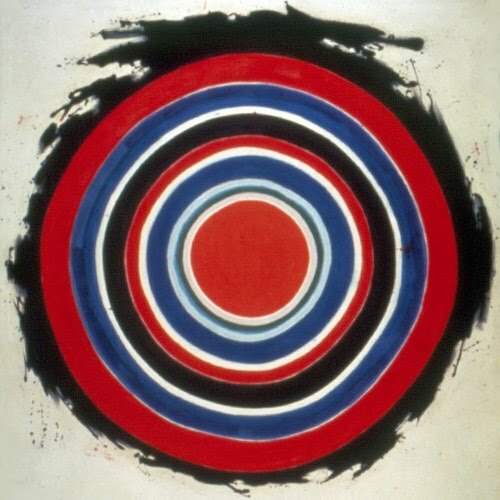 Kenneth Noland. Harry N. Abrams, INC., Publishers. New York. 1977. Waldman, Diane. Kenneth Noland: A Retrospective. The Solomon R. Guggenheim Foundation, New York. 1977. I decided to research and write about Dale Chihuly for several reasons. Of the greatest significance is the fact that his work has captured and inspired my imagination since I was 10 years old. At that young age, I didn’t know his name or any of his credentials, but I was able to identify his work on sight. One thing about Dale Chihuly that I found remarkable was his signature style. Regardless of the medium, Chihuly’s work has born his stylistic trademark. I also admired Dale Chihuly’s daring attitude in his creation of art. In an arena filled with time honored canons, Chihuly garnered respect from the art world, despite his unconventional organic aesthetic. Renowned for his work in blown glass, Dale Chihuly also created vibrant sketches and ceramic pieces. Dale Chihuly was born in Tacoma, Washington in 1941. In the mid 1960’s Chihuly became a student in interior design program of the University of Washington where his interest in glass blowing was first realized. In 1965, he enrolled into the University of Wisconsin’s glass blowing program and eventually received a Master’s degree in sculpture. In 1969, Chihuly began work at the Rhode Island School of Design, where he established its renowned glass program. As the program began, Chihuly began to practice interdisciplinary or multi-media art. This was done in an effort to breathe new life and vigor into the sparsely practiced art form. In 1971, Dale Chihuly cofounded the Pilchuck School in Stanwood, Washington and served as Artistic Director until 1989. As early as 1967, Chihuly began to blur the boundaries of art in his work with the use of neon, argon, and blown glass forms. These materials were used to create free standing, life size installations. 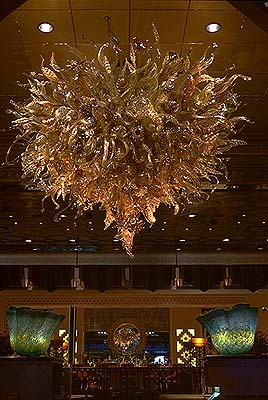 There are several artistic ideas that have epitomized Dale Chihuly’s work. To start, there has been a continued emphasis on light, translucency, and transparency. Chihuly also explored various media in many of his works. 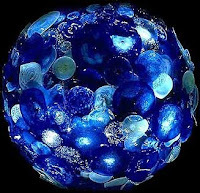 In general, he explored color, line, form, and art assemblage (particularly in glass sculpture). Chihuly’s work also tended to have an organic, natural, recurring theme. For instance, natural phenomena such as icicles and vegetation, gardens, and oceanic life forms have been the subject of exhibits of his. He also concentrated on the function of vessels and their role in the lives of humans throughout history. More recently, Chihuly’s work has concentrated on creating an environment as opposed to ornamenting existing natural or manmade spaces. Also recently, he has explored beyond glass and looked into the malleable possibilities of plastic in expressing many of these same ideas. In pencil, mixed media or acrylic paint (virtually any medium), attenuated, dramatic lines have dominated Chihuly’s compositions. 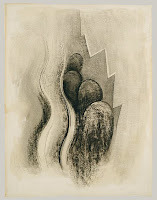 In general, his sketches have been used to express ideas that would later be realized in three-dimension, but recently, great emphasis has been drawn to the similarly stylized quality of his drawings. Over the course of his career, Dale Chihuly has become a pioneer in art, in both pedagogical and practical senses. He has also been a key player in the popularization and establishment of the modern glass art tradition. Lastly, Chihuly’s work has helped legitimize installation art through the acclaim of his many international installation exhibits. He is still creating art today. Oldknow, Tina. "DALE CHIHULY: A SELECTIVE BIOGRAPHY." 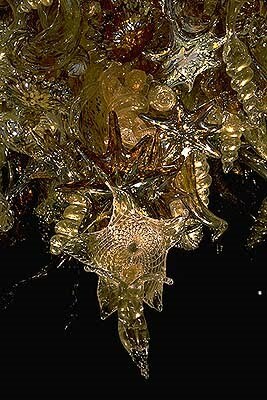 Chihuly Articles. Glass Art Society, Apr. 2000. Web. Nov. 2009. http://www.chihuly.com/essays/oldknow_2003.html. Taragin, Davira S. "Biography." Dale Chihuly. Web. 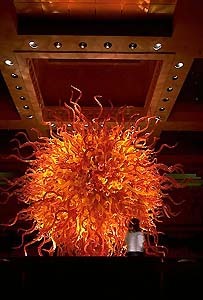 15 Nov. 2009. http://www.chihuly.com/intro.html. I decided to post about Andy Warhol for the post-1900 era because there is currently an exhibition ("Big Shots") at the Nasher Museum of Art which includes Warhol polaroids as well as his silkscreen paintings. Andy Warhol was an American artist who created prints, paintings, sculptures, illustrations, films and writings. He was a leader of the Pop Art movement of the 1960s and his work still influences culture today. Besides his artworks, Warhol is known for his connections with Studio 54 and celebrities of the time. He mixed with a diverse group of people including socialites, artists, street people and musicians. Many of his works give insight on these social circles and also communicate Warhol's philosophies. ("Everyone will be famous for 15 minutes"). Below I discuss different works of Warhol. http://www.uky.edu/ArtMuseum/graphics/Warhol%20polaroids.jpg One of Warhol's favorite mediums was polaroid photography. With a polaroid camera Warhol was able to produce portraits immediately and the portraits produced are iconic. In his portraits Warhol was very specific in posing his models in order to portray differest qualities. With women, he would cover them with white powder and bold makeup in order to accentuate their features. He would also ask his female models to remove their top clothing and wear a cloth around themselves. When posing his male models Warhol paid close attention to the hand positioning. Warhol used hands to symbolize manliness and other characteristics and in many of his polaroids of male models the hands look quite awkward. The Warhol exhibit at the Nasher has many examples of Warhol polaroids. Warhol is very well known for his iconic silkscreen paintings. 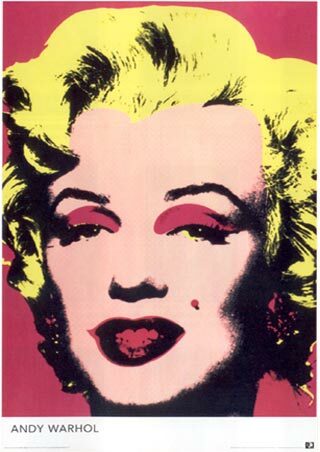 Perhaps his most well-known silkscreen portrait is of Marilyn Monroe. These paintings revolved around celebrities and bright colors. The paintings were all based on photographs (polaroids) and started off as snapshots. As I mentioned above, Warhol mingled with many artists, and celebrities. He became the manager of the band The Velvet Underground in 1965 and created this album cover for them. Warhol's status elevated the band's status and this album is well known for it's Warhol artwork. The album originally came with a banana sticker that said "Peel slowly and see" and underneath the sticker was a flesh-toned banana. This is another example of Warhol's influence on pop culture. Warhol turned a Campbell soup can into art and his painting shows his idea of commercializing art. He repeated the image of the soup can over and over again in mass production and captured the idea of consumerism and commercialization. Warhol's friends, fame and philosophies all influenced his work. Andy Warhol was born in Pennsylvania on August 6, 1928 and at an early age showed an interest in art and studied commercial art in college in Pennsylvania. He had his first fine art gallery exhibition in LA in 1962 and continued his career in art in Los Angeles as well as New York City. In both cities Warhol befriend all kinds of people, from the homeless to celebrities. In 1968 however, Warhol was victim to an attempted assassination and became a much more closed off person and continued his life more quietly. Warhol died on February 22, 1987 in New York City. This semester I enrolled in a South African History course and have studied the political and social implications of the system of apartheid, or institutionalized racial discrimination, of the South African government before 1994. Although the apartheid system was not formally instated until 1948, Sekoto must have experienced the immense cruelty of racial hatred throughout his early life in South Africa. Because art often serves as social commentary and can reflect the underlying tensions within a society or nation, I hoped to gain further insight into South Africa, a nation plagued by racism and oppression during the artist’s lifetime, by examining Sekoto’s paintings. I find that the artist’s work is a profound manifestation of art’s ability to illustrate the consciousness of an oppressed group of people. Born on September 9, 1913 in Botshabelo, a mission station in the Transvaal of South Africa, Gerard Sekoto became known as the father of South African art (SAHO). Although he studied to become a schoolteacher, teaching at Khaiso Secondary School from 1934 to 1938, Sekoto became interested in drawing and painting. 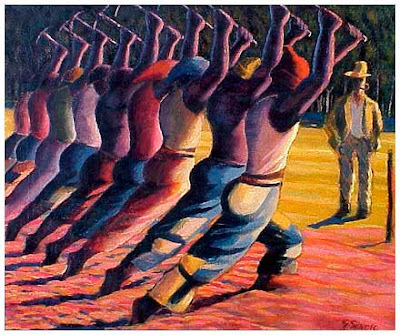 After winning second place at a national art competition at the University of Fort Hare, Sekoto moved to Johannesburg where he built a strong reputation painting landscapes and everyday scenes of black life (SAHO). In 1940, one of Sekoto’s works became the first painting by a black artist to be purchased by the Johannesburg Art Gallery (World Wide Arts Resources). Unhappy with his working conditions in Johannesburg, Sekoto traveled to Cape Town, where he became extremely productive and developed a unique personal style. After spending two years in the Transvaal, during which time he became more dissatisfied with his working conditions and began to truly sense the oppression of the oppressive South African government, he left for Paris, where he dabbled in both the music and art scene of the city. Sekoto became emotionally and culturally reconnected with his homeland of South Africa when he visited Senegal in 1966 (SAHO). However, as a result of new restrictions under the apartheid regime, the South African government revoked the artist’s passport during that year. Throughout his career, Sekoto painted primarily South African subjects; however, he used European styles such as impressionism, cubism, and orphism to convey social realism in his urban black art (World Wide Arts Resources). Sekoto’s works convey the social tensions of black culture in South Africa and became increasingly political throughout the artist’s life. Gerard Sekoto died in Paris in 1993 and in 1995, researcher and correspondent Barbara Lindop published a book about Sekoto’s life and works, including numerous newly discovered songs he had written throughout his life. Interior Sophiatown, painted in 1939, is a relatively nonpolitical work from Sekoto’s early career. The colors and postures of the figures indicate warmth and tranquilty. During the 1940’s and early 1950’s Sophiatown became a center of black art, politics, and culture; however, in 1955, the ruling South African National Party passed the Group Areas Act which ordered for the removal of the black residents of Sophiatown for the purpose of building a white suburban neighborhood in its place. Interior Sophiatown represents the peaceful nature of life in this township before it was bulldozed to the ground years later. The Song of the Pick, which Sekoto completed in 1947, displays far more heat and tension, serving as a far more political commentary on black life in South Africa. 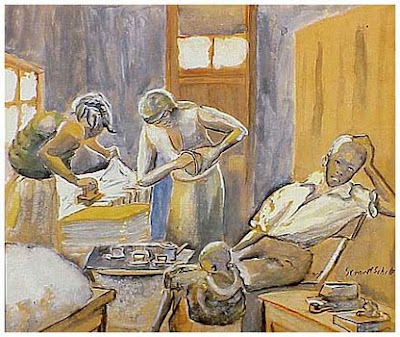 A depiction of black workers under the supervision of a white overseer, this painting depicts the racial tension of South Africa in this period. Raising their pickaxes in unison, the black workers seem to form a phalanx against their white supervisor. Although ostensibly an illustration of black workers on the job, these men seem united in defiance and poised on the brink of attack, and, since their faces are obscured from view, it is difficult to tell whether they are looking down or facing their oppressor. This painting represents a decisive moment and possibly Sekoto’s prediction of a future revolt. 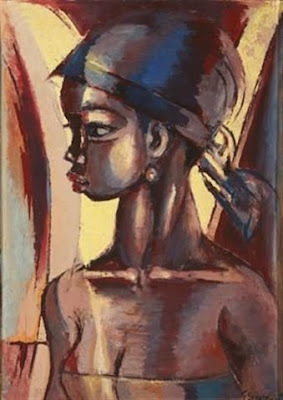 One of Sekoto’s later paintings, Girl with a Turban is ostensibly a nonpolitical illustration of a black female completed in 1978. However, her rosy lips, smooth skin, and delicate features demonstrate an idealization of black men and women consistent with the views of the Black Consciousness Movement, which had reached a climax during these years following the death of the movement’s leader, Steve Biko in 1977. This movement maintained that “black is beautiful” and encouraged black South Africans to be proud of their ethnicity. "Gerard Sekoto." www.sahistory.org.za. SAHO. Web. 19 Nov. 2009. "Gerard Sekoto (1913 - 1993)." Absolutearts.com. World Wide Arts Resources, 5 Oct. 2009. Web. 19 Nov. 2009. .
"Gerard Sekoto: SA's artistic icon." SouthAfrica.info. National Arts Festival, 3 June 2004. Web. 20 Nov. 2009. /sekoto-tribute.htm>. 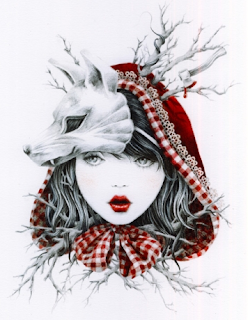 Courtney Brims is a self-taught artist from Brisbane, Australia. She attended the Queensland University of Technology, graduating in 2005 with a degree in interior design. After working in interior design for two years, she decided to pursue her love for drawing on a professional level. 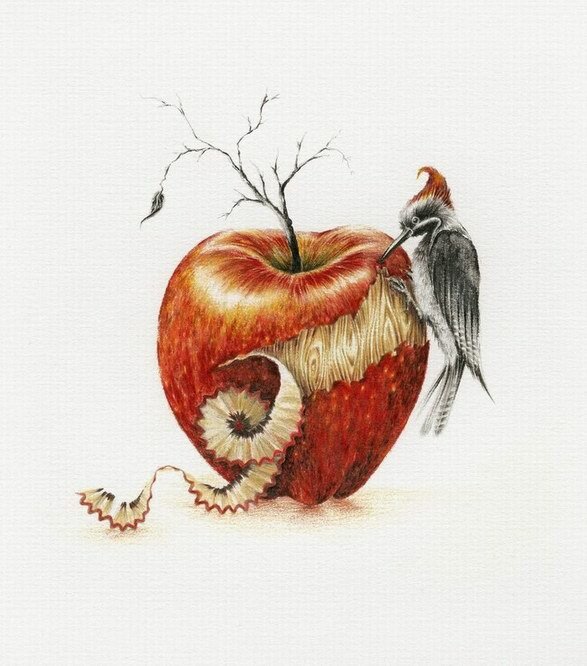 Brims works mostly in pencil, with minimal use of colour. 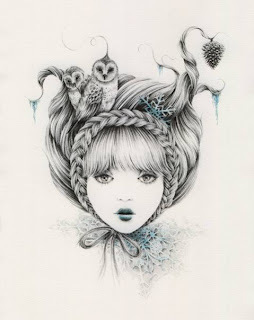 Her work has a very whimsical, dreamy feel to it. Elements of popular fairytales and Victorian illustration are also present. I just stumbled across this in my History of Photography class and though it was interesting. I really enjoy drawing from photos rather than observation. I think it helps me flatten out the image and think about it's shapes more than allowing my mind to run away with the possible shapes that are thought to be there yet aren't. I at first thought my preference for drawing from photographs was odd and then I found Kenyon Cox. 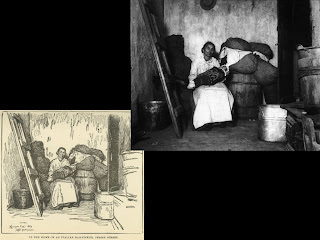 He drew mainly from documentary work during the turn of the century. 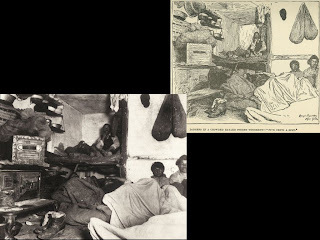 Here are two examples. Enjoy! Mariano Salvador Maella was a Neoclassical Spanish Painter that contributed to the art world within the early 18th century. His art work exhibits beautiful use of light and dark shading as well as detailed illustrations of saints and human figures. His work was commonly commissioned for the Spanish Royalty and prolifically exhibited in Byzantine Cathedrals. A lot of his work had a religious theme, the painting to the right for example, titled Adoration of the Shepherds, depicts Baby Jesus surrouded by Shepherds, Mary, and Angels. Maella's talent illustrating light sources, makes it seems like Baby Jesus is radiating and adds an ethereal quality to the painting. 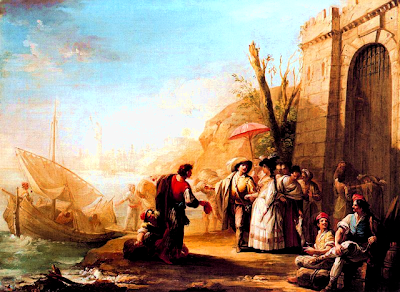 The painting up top, titled Marina, depicts a ground of individuals around a marine port. Again Mariano Maella adds brilliance to his light sources and portrays the skyline and clouds beautifully.